Of all the forms of art that intellect has conceived to beautify and bless our lives, to help us to forget and forgive the trials and tribulations of existence, from the earliest emergence of awareness to the last failing perception, none is so intimately associated with our every experience, as music. Music is well named the universal language, not only because it is understood and felt in every land, by every race, but also because it voices and influences the universal experiences of all humanity. None is in such close touch with every phase of life's ebb and flow, of emotions, dreams, hopes, and fears as music. It has been well said that we all love to "emote". We enjoy thrilling to the vividly expressed emotions of others in the strains of great music. It adds so much to our own emotional experience and we are pleased to find the moods we have ourselves felt or imagined, reflected in musical art. It puts us in touch with other minds and hearts. It gives us comfort in feeling that, in joy or in pain, we are one with all humankind. Music is the golden chain whose links bind all humanity in a bond of common feeling and fellowship. Gods may rise and fall, faiths may wax and wane, creeds be made, modified and abandoned, but music remains, outliving them all. What matters the form or name of the particular cult which music is called upon to serve? The essence, when reduced to the last analysis, is virtually the same; the effect practically identical in every case, from ancient Egypt to modern America. Creeds may falsify the facts, dogmas may deny the fundamental truths they assert, preachers may vilify and blaspheme the very God they claim to serve; but music remains true to the ultimate realities. In later life, when we have reached the introspective and retrospective age, we are prone to live in memories, rather than in hopes and aspirations. Associations from our youth add a sort of mystic spell to the charm of certain strains of music. The half-forgotten fragment of a tune, heard or recalled by accident, is filled with reminiscences sadly sweet. It will unlock storehouses of memory forgotten for decades and we live again among the refreshed scenes and persons of the long-buried past. This is the secret hold certain old, familiar melodies have on all of us; not their intrinsic worth, but the associations connected with them. At last, when we come to the end of our days, music provides its last comforts. Tolling bells and muffled minor measures of the funeral march accompany us to our last resting place. As Tennyson said, "Music that gentler on the spirit lies than tired eyelids upon tired eyes". Thus, music is the first, last, best, most constant of our friends among the fine arts. It meets us at the threshold of life with gentle, caressing voices. It cheers and strengthens us to the loftiest endeavors. It quickens our purest, deepest emotions. It echoes our every mood and experience and leaves, reluctantly, at last only when its soft, solemn harmonies have muffled the clang of the iron portals of the tomb. Or does it leave us even then? We can only note that in all dreams and pictures of the hereafter, music is the only one of the fine arts which has a place. We don't hear of poets writing or reciting great verses, or of artists painting pictures. But, we do hear of the harp, which is the emblem of instrumental music, and of choral harmonies among the angels, typifying vocal music. It has been said and often quoted, "Music is the only thing in Heaven we have on earth, the only thing we take to Heaven". In this issue, we've chosen songs that exemplify this journey. Richard G Beil, March 2012. This article published March 2012 and is Copyright © 2012 by Richard G. Beil and The Parlor Songs Academy. Text, images or music may not be reproduced in part or in total without express written permission of the author..
Long before a baby can understand spoken language, it perceives and responds to the soothing influence of the lullaby, softly crooned by mother or nurse. The child feels the heavy, protective love expressed in these sweet tones. It is quieted by the gentle magic of the soft refrain. 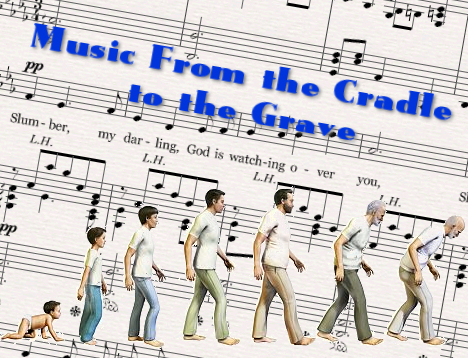 This is its first introduction to any form of art - the cradle song. The cradle song is probably the oldest and most widely known and used of all musical forms. The character and moods are always the same and the uniform keynote is maternal love. This particular song is one of the most peaceful and beautiful lullabies that we've heard. With an especially good set of lyrics and a wonderful melody, it is a surprise that this piece has not found its way into the current repertoire. As the child grows, it finds the natural expression of exuberant spirit in the strongly marked rhythms and lively swinging melodies of the simpler forms of music. They whistle or sing at play or as they go hopping and skipping off to school. Upon entering school for the first time, children are filled with a sense of wonder and pride at having finally achieved a "milestone". After a few years, that initial feeling begins to wear off. We can all remember telling our parents at some point, "I'll sure be glad when I'm grown up and don't have to go to school any more". And, the universal reply went something like, "Just you wait. There'll come a day when you'll wish you were back in school, with no worries and no bills to pay". Here's a lively tune that captures that feeling. This video contains the "patter" chorus that describes an incident to which all of us can relate from our own school days.